Scrap reporting is part of documentation, conducted to reporting scrap during various operations from machinery at workplaces for minimization scrap percentage. Scrap reporting documentation, and related documents are require for implementation and reduce scrap at workplace. To identify workplaces, machine and process which are generating scrap during startup, shutdown or in-process scrap. It is necessary for organization to establish standard procedure. When investigation team identify the scrap generating from multiple sources or processes. When any job has started require to setup of machine as per required parameters as per product standards, technical requirements, dimensional setting etc, are managed. The making perfect and maintaining tolerances of product sizes needs to some trials. Each trail generating scrap to get the perfect product. Hence setup is general source of scrap. The records are needs to maintain in setup log or hourly check sheet / register with the time taken to set the machine up. When the machine setup is completed and notifies the quality control team that the machine is producing product according to specifications. The quality team personnel should be verified that produced material are correct. Once the all quality control team are agreed that machine setup records. Scrap details and defect occurred during setup are recorded. Quality team is manage and recording in-process scrap identification, and defects. The quality engineer are confirm the defected / off quality situation. At the movement the machine require to immediate shutdown, and to stop defective pieces producing. The quality person is remain at the machine, to ensure all scrap collection processes are followed. And its concern records should be updated. The defective project behind many reasons, causes and sources that needs to identify by verifying visually as per technically. Generally mechanical issues cause defective product once the setup was successfully established. In the movement of machine problems, once the quality engineers declare the defective product identified. That require to immediate call to maintenance team to visit and conduct necessary processes. To ensure the machine is running sufficiently. The machine may need to continue to work the machine while the repair is being completed. On restarting the process need to take the several attempts to ensure the product is in order of specifications. The documentation is maintained by supervisor to department manager on daily basis. 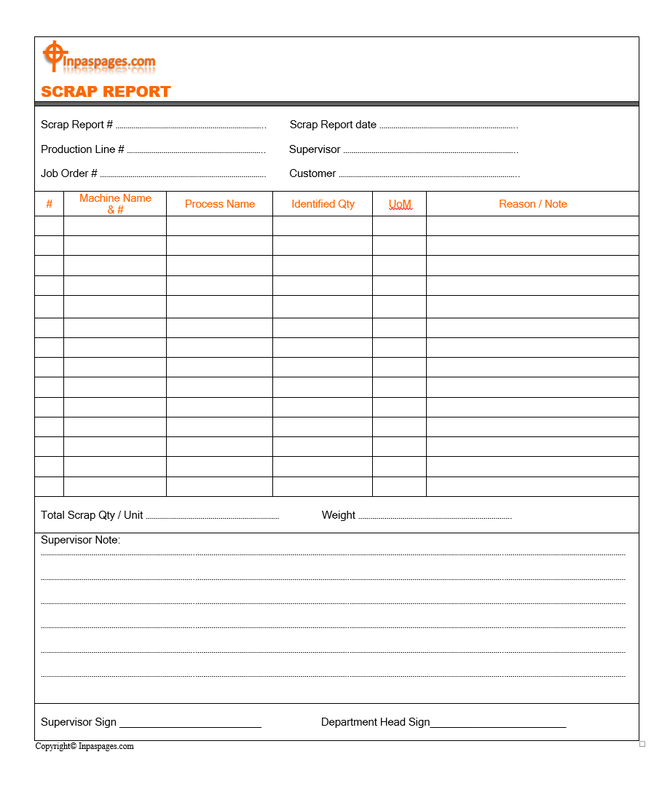 The reports for the generated scrap are maintained in scrap report format. Check the basic process flow and diagram for particular product which is going to manufacturing. Discuss before setup machine (by department manager) with operators, technical team for customer technical requirements of product specifications. Dimension requirements to minimize trails of product. Take the advice of experienced personnel / skilled operators for setup machine and its parameters. Arrangement meeting of technical team, cross function team to discussion on received orders for manufacturing product, if the quantity is enough for specific arrangement. Training to machine operator for setup / maintain the parameter of machine and about product specifications and customer requirements. Department manager responsible for verification of each preventive maintenance is conduct properly at frequency defined. Maintenance manager is equally responsible for verify and review of each preventive actions, and processes with machine. Department manager collecting information from various departments and from machine records. To identify the occurred errors, defect in product to analysis the scrap sources and reasons. It is important that all the information recording are accurate. Because on basis of documentation, it is easy to analysis of data, and identification of root cause of defects. As well are sources of scrap. There are many methods to identify and implementation of scrap analysis, and effectively minimize scrap ratio in production area.